Pittsburg Police Officer Hunter Peterson was recently promoted to the rank of Corporal. Peterson joined the ranks in January 2014 and is a four-year veteran with the City of Pittsburg Police Department. A native of Great Bend, Kansas, Peterson came to Pittsburg to study at Pittsburg State University. He graduated from PSU in 2012, earning a Bachelor of Science in communications degree, with an emphasis in photojournalism. Peterson is certified by the Kansas Law Enforcement Training Center (KLETC) Academy and has more than 800 hours of law enforcement experience, continuing education, and academy training, including community policing, missing and exploited children, pursuit driving, active shooter, TASER certification, defense tactics, field training instruction, special response training, child car seat technician training, and more. 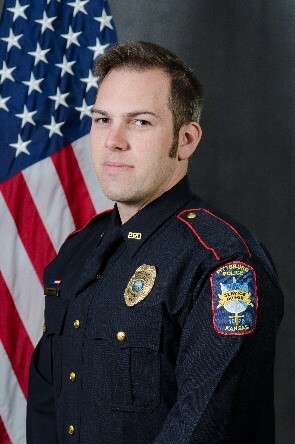 Prior to his promotion to Corporal, Peterson held the rank of Officer II, and was tasked with training new officers, patrolling the community, and assisting residents to address crime. He also responded to alarm calls, made traffic stops, secured crime and accident scenes, and collected evidence. As Corporal, Peterson serves as an entry-level patrol supervisor. His primary role is to assist patrol officers on the streets with decision making, and has a limited administrative role of reviewing and approving police reports. He also serves as a Field Training Officer (FTO), team member on the bike patrol, as well as a Special Response Team (SRT) member.